Situated at the edge of the HaMa'ayan HaRadum Square, in the heart of the Artists Quarter, the Khan of the White Donkey (Khan Hahamor Halavan) is one of the three oldest buildings in Safed. The Khan has been lovingly restored over the last two years and offers a great avenue for musical performances and other cultural activities. During the restoration of the building, its archeological history was revealed. It is at least 700 years old. It could even be older, as it is exactly aligned on a north-south, east-west axis which is typical of Crusader buildings of the period. One of the features uncovered during the building work was the Crusader style "groined barrel vault" ceiling. Whether it was first built by the Crusaders and added to by the Mamlukes or built by the Mamlukes to a Crusader design is unclear. One thing is certain - it was built strongly enough to survive the various earthquakes suffered in Safed. Because of the historical nature of the building and the environmental philosophy of the Center for Healthy Living, an organization that helped with the renovations, the building was restored using natural materials and traditional methods. This even included removing existing cement from the stonework and replacing it with traditional lime mortar. The team also imported a special lime mix from Venice that should be able to cope with the wet conditions in Safed. One unique feature they made was the largest poured lime floor in Israel. As part of its approach, the building team experimented with different building materials in different areas. One technique they used was a mud and straw mix, sealed with linseed oil, to test its staying power during Safed's rainy winters. It also has a grey water recycling system in place and a low energy heating system using a combination of heat exchange technology and photo voltaic solar panels. Of course as part of their educational mission they separate waste into various categories, recycling and composting as much as possible. The Khan, situated next door to the central mosque, now the General Exhibition, was used as a combination of a travelers' inn and indoor shuk for hundreds of years. 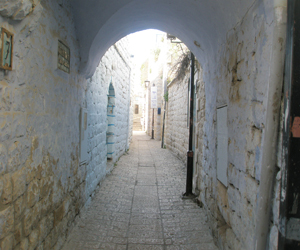 It is fairly probable that the great kabbalists and sages who lived in Safed in the 16C-17C would have done business here with the local Arab traders. Merchants came from far and wide with their merchandise on donkeys as evidenced by the massive amounts of composted donkey dung removed from the building! So the name - The Khan of the White Donkey reflects both the past -a khan and the future - the white donkey, which is a kabbalistic reference that the Messiah will arrive in Safed on a white donkey before travelling to Jerusalem. The Khan is a center for environmental education, community activities and a venue for cultural events. At the Khan local artists and musicians, as well as nationally and internationally-known artists, perform. It has become a center of cultural activities for the entire northern region. In addition to the concerns the Khan hosts a regular public health day when clients can receive acupuncture treatments and other alternative health care at reduced rates. These treatments are facilitated on a drop-in basis on Sundays.